Recent research from the National Human Genome Research Institute has revealed that large amounts of human DNA once thought of as “junk” actually play a critical role in regulating how genes are expressed. While only two percent of the human DNA is made up of actual genes, sections of DNA with the directions for building proteins, researchers have found that most if not all of the remaining 98 percent of the human genome serves an important job. In the Sept. 6 issue of the journal Nature, the research team reported a complex system of switches controlling which genes are turned on or off in a cell at a given time. Regulatory switches may play in important role in the development of diseases that share regulatory networks, such as autoimmune disorders including Crohn’s disease, lupus, and rheumatoid arthritis. The research of New Zealand-born physicist and molecular biologist, Maurice Wilkins, led to the advancement of radar technology and the discovery of the structure of DNA. In addition to developing improved radar screens during WWII, Wilkins worked on the separation of uranium isotopes at the Manhattan Project. He pioneered the use of X-ray diffraction to produce images of crystallized DNA leading to the discovery of the double helical structure of DNA by James Watson and Francis Crick in 1953. Maurice Wilkins received the Nobel Prize in 1962 for his work with Watson and Crick in determining the structure of deoxyribonucleic acid (DNA). 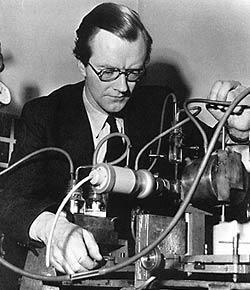 Maurice Wilkins operating X-ray crystallography equipment. Photo: King’s College London and Horace Freeland Judson. 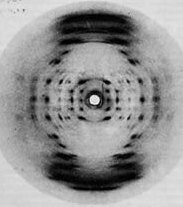 An X-ray diffraction photograph of A-form DNA taken by Maurice Wilkins in 1950. 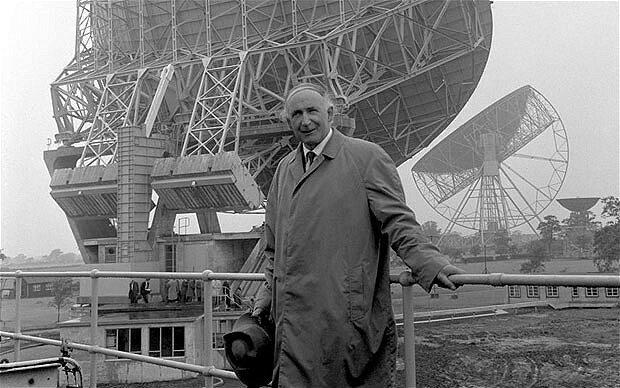 Sir Bernard Lovell, physicist and radio astronomer, died on August 6, 2012 at the age of 98. Well known for his development of the first radio telescope, it was Lovell’s work on radar technology used to detect German submarines surfacing under the cover of darkness that aided the Allies in reducing shipping losses in the Atlantic during WWII. Post by Annie Tête, STEM Education Coordinator.